Thanks to Marsida Gjonça at the UK Embassy in Tirana, on our first ever visit to Albania we selected the Jonathan Centre, which assists children and teenagers with Down’s syndrome, autism and with other similar special needs, while at the same time to increasing the awareness of their families to achieve the best for their life. All right in the very heart of Tirana. 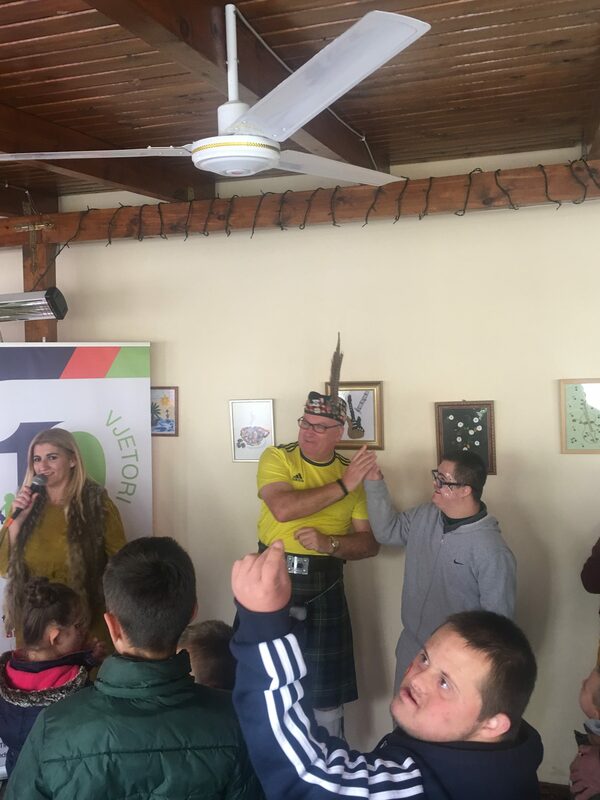 They offer therapies (speech, occupational, art, music), counselling, training and life skills courses to children and young adults with Down’s syndrome and also organize public awareness events on the potential of individuals with Down’s syndrome when given the opportunity. 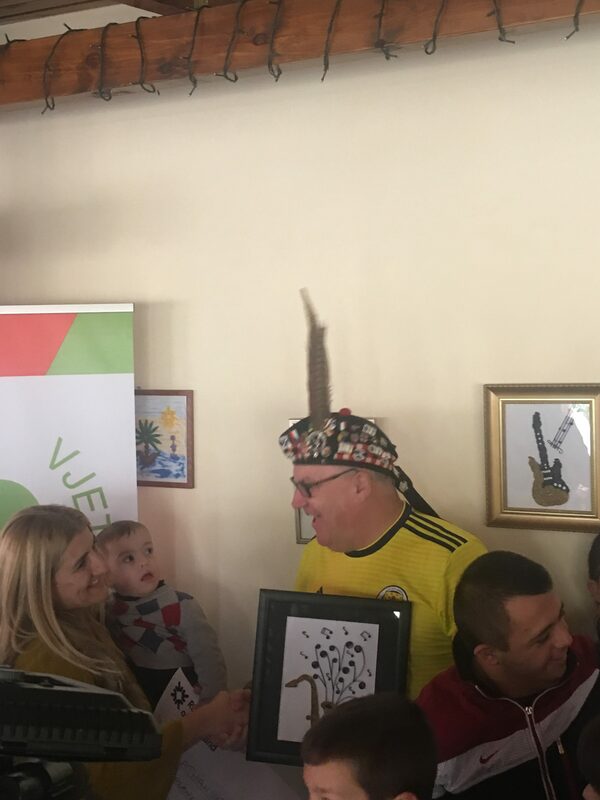 Their intention is to bring a change in the spiritual approach and the possibility that Albanian society can accept and create an environment where children with special needs can be integrated and achieve the best in life. Our visit coincided with their 10th anniversary and so on the morning of matchday, a dozen TA footsoldiers made the journey to visit the centre, and what a reception we received. There were upwards of 20 children present with families and friends totalling over 60 locals to welcome us as we arrived. We were given a guided tour of the centre which uses art and music as a therapy for the children. The centre is named after Jonathan who has Down’s syndrome and is run by his Aunt. He is now 14 years of age and we were duly introduced. He was genuinely thrilled with our presence – as were all the children. After a few speeches and the presentation of the cheques, the children sang a few songs for us. 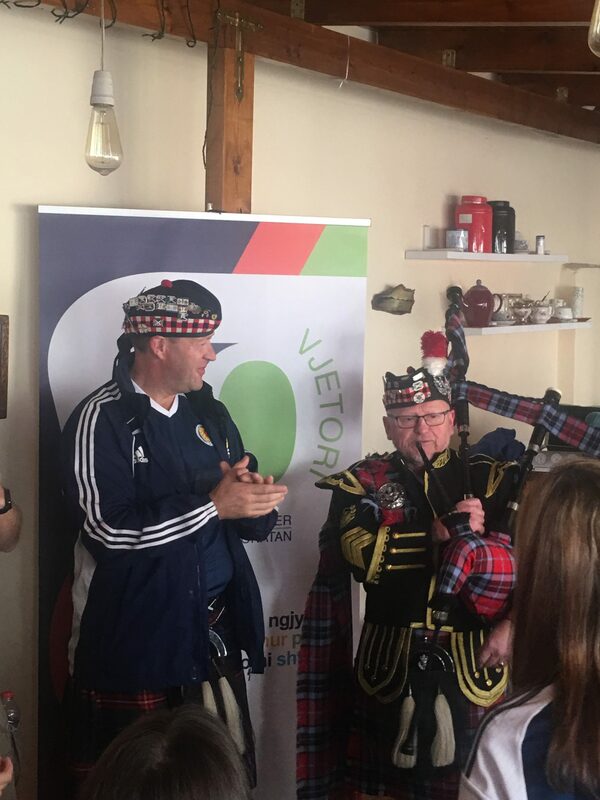 Thereafter, Wullie Masson and Carole Smith played a few tunes on the bagpipes, much to the delight of the locals. We were there for over an hour and the children were reluctant to let us go, wishing we would stay longer with them. With the money we donated they hope to set up a snooze room for babies that come to their center in order to give them a calming and relaxing environment.